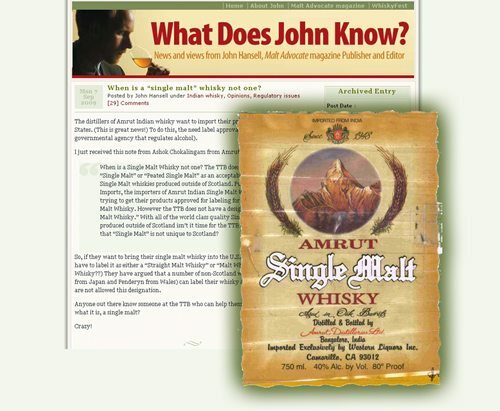 The Malt Advocate blog had an interesting article about Single Malt Whisky from other than Scotland (specifically, Amrut Single Malt Whisky, made in India). The initial post, on September 7, 2009, tends to suggest that TTB would not allow “Single Malt” on whiskies produced outside of Scotland. Amrut is sold in the UK with no objections from the [Scotch Whisky Association], since it’s clearly labeled as an Indian product. The SWA goes ballistic when someone in another country tries to pass off locally produced whisky as Scotch. With admirable understatement, the distiller (Ashok Chokalingam) observes (comment 11): “This is a pain the neck for us.” He also explains that he cleared it with the SWA before the launch — in Glasgow, Scotland. Other commenters proceed to mention several good examples of already approved Single Malt Whiskies not from Scotland. Just two days later, Ashok reports (comment 23) “[At least for] now, the terminology issue is sorted out. This is half of the battle that got over.” At comment 27, TTB tends to say the regulations require a Malt Whisky label to indicate “Straight” if aged two years or more. More than a month after Mr. Chokalingam said the issue is largely resolved, there is still no sign of a new label approval for this brand. Stranger still, the 2004 approval (for Amrut Single Malt Whisky) has been sitting in plain view the whole time.